Getting bottles thrown at them even before Bully Ray and swerving listeners, it’s Wrestle Talk Radio! Join hosts Omega, Tim Stein, Lindsey, Mase and the producer Sir Rockin as they discussed all that was the past week in professional wrestling, including the passing of William ‘Paul Bearer’ Moody and everyone’s memories of the Legend. We would all like to pass along our condolences to his friends and family. 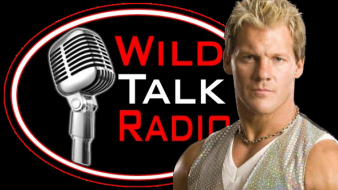 We were also joined by WWE/ECW/WCW Superstar, lead singer of the band “Fozzy”, best selling author and host of SyFy Network’s new show “Robot Combat League” Chris Jericho. In a nearly 20 minute interview, he discussed his new show ‘Robot Combat League’, what he thought when he first saw the robots, how these robots work and what kind of carnage they can dish out, having George Lucas’ daughter on the show as a contestant and the technology of today, his recent Australian tour with Fozzy, if he has thought of doing more acting in the near future, his 2007 heel turn and the inspiration of that character, his current goals or plans for his most recent return, his WrestleMania 19 match with Shawn Michaels, his short hair decision, what his favorite promo or ‘bit’ of all time is, what ‘Hold 1004’ really is and so much more. We are also the source for an immediate and in-depth recap and critique of TNA’s Lockdown PPV. We discussed the hot open for the X-Division Title, everyone’s favorites green in the ring lawyer going for the W, a Tag Team Title match (but was a certain ‘IT Factor’ there?? ), an evolving situation in the Knockouts Division, and the three Cage matches featuring Lindsey’s #Favorite *Wes* and some shenanigans, the Lethal Lockdown highspots and a flying beard, and the main event that left everyone throwing bottles into the ring and with an epic promo, plus much more.